Just a few minutes ago (as I begin writing this) the first of three hour-long, free demos for Splatoon has ended. In a way, it’s odd to require everyone to participate in a demo at the same time (and god knows I’ve read enough grumbling about it elsewhere) but since Splatoon is a competitive shooter, it makes sense. It wouldn’t be much fun, or much of a sales pitch, if someone downloaded the demo just to sit around waiting around for other participants. It’s also true, though, that Nintendo used this as a pre-release stress test. It was a good marketing move to turn a server test into an interactive commercial, and they might get a sale out of me now that they wouldn’t have gotten before. But here’s what this Splatoon trial really accomplished: it reminded me that I miss Events. That’s captial-E Events. In a world where everything is available at the push of a button, we start to lose a sense of importance. We can have so many things at the instant we want them…but at the cost of a reduced value. When it’s always there, and it’s always accessible to anyone who wants it, what is it really worth? At a very young age (well, before I could drive) I fell in love with attending live concerts. Woodstock ’94 was actually my first concert, period, and it served, I’d say, as a pretty incredible introduction. It was several days long, there was some great music, there was camping, food, vendors…it was a great time. I remember much of it well. It wasn’t a patch on the original festival, I’m sure, but for some little kid discovering live music for the first time, especially in the early 90s, you can’t have asked for much more. After that I’d see everything I could. Growing up in New Jersey sucked, for sure, but I was within easy commuting distance of Philadelphia, New York, and D.C. Between those cities — and New Jersey’s own venues — I was able to see almost anyone who was touring at all. And it was great. When the artists — whomever they were, whether or not you even knew their names — put on a great show, it felt that much more special for the fact that it was temporary. Fleeting. You spent your time, money, and effort to get there, and so did everyone around you. You’re there for a purpose…a common experience. You share with a room or a field or a stadium full of people something that would only happen once. Right then, right there, and then never exactly the same way again. It was yours, and it was theirs. You were in it together. At some concerts I’ve made friends. At others I didn’t talk to anyone I didn’t already know. But the experience was communal. A wave of applause, gasps, sighs…the artists creating — creating — something there for you. You could have stayed home. Most people, obviously, do. There’s nothing wrong with that. But if you choose to make that journey, you get to witness something that will never happen again: that one particular Event. Concerts still exist, and the reason I bring them up is the fact that they’re still popular. They’re still happening. They’re still one way to keep Event experiences alive, while film events and television events and video game events leak early, or immediately. While we can dial up almost anything we like on YouTube (or less-savory equivalents.) While we can torrent the complete works of almost anyone you’d care to name. And that’s not, in itself, a problem. It’s magical, to be sure. But, again, it’s magic at a cost. I remember reading a Bob Dylan biography years ago, in which the author struggled to describe to us the sound of some bootleg tapes he personally obtained. There was something lovely about that…an attempt on the part of the writer to reach the reader and convey the accomplishment of a musician. I was several degrees removed from whatever that song was that the biographer was describing, but I was rapt. I tried to layer it in my mind. I tried to hear it, impossibly, through text. Today? I could type the name of whatever song it is into Google. I’ll be taken to a streaming version I can listen to right now, a dozen covers of it by amateur musicians, a legal opportunity to purchase it as an mp3 or a ringtone, and an illegal opportunity to download it along with another hundred Dylan bootlegs I never knew existed. Today I’ll know what it sounds like, easily. Which is nice. I’d have died for that opportunity years ago. But it also robs the listening experience of being Eventful. I remember when I was very young. Word got around that somebody on my block could beat the original Mega Man. I was skeptical. That game was tough as nails, and I was convinced no human being could finish it without cheating. I wasn’t alone in my suspicion. So my friends and I got together, and we walked over to this kid’s house. We sat in his living room, eyes glued to the television set, watching him as he tried, over and over and over again, for hours, to beat Dr. Wily and save the world. When he succeeded, the thrill in that room was incredible. It was emotional. There was screaming and there was laughter. You’d have thought we’d liberated Ireland. In retrospect, I’m sure his Mega Man skills were nothing impressive. He finished the game, which was more than we could have done, but today I can watch any number of people anywhere in the world playing the game perfectly. I could see somebody finish it in 20 minutes without dying. And I have. But it didn’t move me. I didn’t care as much. It was something to watch. It was cleaner, more structurally perfect, more accessible. But it wasn’t an Event. I don’t know who I played with. I don’t know if I’ll ever meet them, and I’d be surprised if I ever did. (And if I did, it’s not as though I’d know it.) But like all the people I never interacted with at the concerts I attended, they shared an experience with me. Splatoon was new. It was unique to everyone there. Nobody had prior experience with the weapons or the stages. Nobody had time to strategize. For everybody involved, it was a process of live, communal discovery. And that’s something that I haven’t felt in a long time, and probably ever in terms of online gaming. Whatever happened, happened. If you were there, you know. If you weren’t, you don’t. And if you attended one of the other two demonstrations, then you know something I don’t. Every experience was valuable, simply because it was fleeting. I know that this was a one-off (well, three-off) Event, but I would love it if this kind of thing became more common. Once a month, at a certain time, you could log in and play the game with some twist that isn’t announced beforehand. Maybe a new weapon or stage, but it doesn’t have to be anything that substantial. The twist could be that all of the paint is the same color, and you don’t know whose is whose. Or that everyone moves at half speed. Or that every thirty seconds, everyone dies and respawns somewhere else, turning the game into a challenge of orientation as much as it is one of survival. Those are just ideas, and I wouldn’t say any of them are very good. But I do know that for one hour (which felt, but was not, far shorter) a game I didn’t care much about in a genre I’m still not interested in became a magical experience. What’s more, it was magical because I didn’t get to experience it on my own terms. In a world of instant gratification, restrictiveness really does feel like a big step forward. it was interesting doing the splatoon demo, then going to Twitter and seeing everyone talking excitedly about it. I will definitely try to catch the last two events as well. By the way, my Wii u ID is Toad64 if anyone wants to add me. 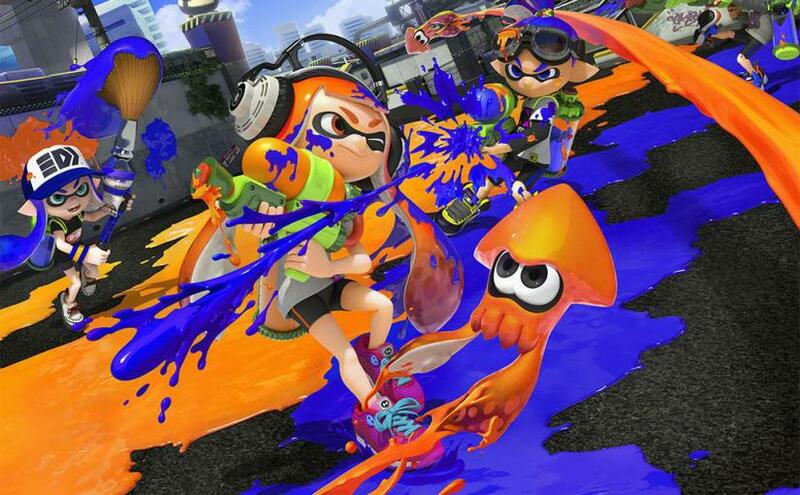 I think I’ll definitely be getting Splatoon when it comes out. I’ll add you, Toad! Mine is ChickenBrutus, for anyone interested in adding me. I’ll pretty likely be picking this game up. The sense of community events like that bring out – sorry, Events like that – really is something to be valued. It’s why so many people buy games Day 1, despite knowing, as we all do, that modern games are always released buggy, broken and sometimes unplayable. But being part of the social experience of everyone playing/discovering it for the first time is something that can’t ever be repeated. The way people in various MMO communities discuss being there “day 1” with all the technical issues is as close, I would guess, to a “concert” that genre would get. It’s also a “rite of passage” to some, and that’s less cool, but the same can be said about music snobs and some concerts. I assume it’s similar to lining up for an iPhone or some other piece of merchandise. The watch/phone/toy you get is improved not one physical iota, but you attach a memory of a communal Event to it, and it becomes (hopefully, for a time at least) a symbol of something more.